A film that is probably getting a little more love than it deserves, Starred Up is a 2013 made film released here in 2014 that is gaining some momentum by appearing on quite a few year-end lists. It’s popularity resides firmly in three performances; an astoundingly good Ben Mendelsohn, raw stripped back direction from David MacKenzie and a well executed starring role by Jack O’Connell who, of course is the famous lead of Angelina Jolie’s much chatted about forthcoming Unbroken. This is undoubtedly why the film is gaining so much traction now, which is a little dishonest, because the film should be analysed a little closer and its alarming adherence to cliché weeded out. The plotting and overall narrative structure let the film down, and it ends up being little more than a vehicle for those fine performances and a chance for David MacKenzie to appropriate what looks like a fascinating story for his own directorial agenda – which isn’t the worst thing you can say about a film, but frankly, MacKenzie shouldn’t get away with it so easily. 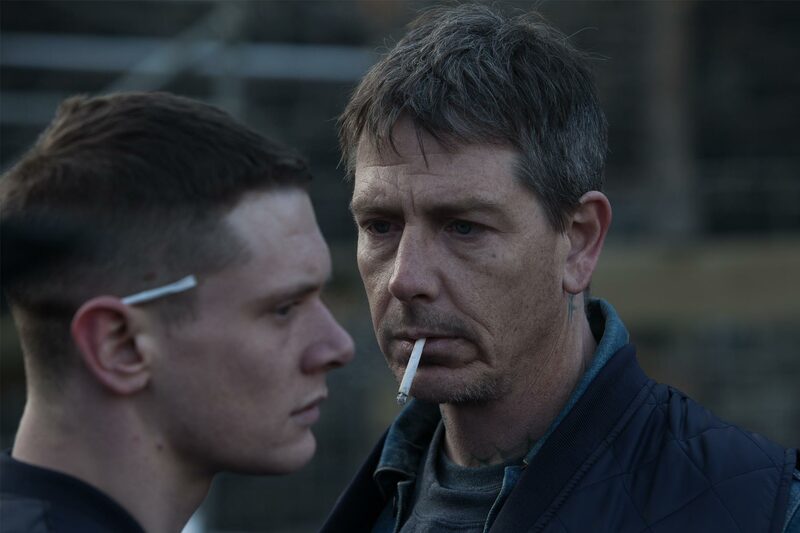 What works so well in Starred Up is the relationship between the rather painfully named Love’s (Father, Mendelsohn as Neville and son O’Connel as Eric) relationship as each struggle for what they need and want to give to the other in the hyper-realised masculine surreal prison environment. It is easily the most interesting aspect of the film, and if it labours the point of the tough take-no-prisoners attitude to “sole-survivor” (this film is so testosterone passionate it could make the most intellectual male want to go out and beat his friends at football) this is balanced precariously against the desperate need erupting between the Love’s for familial safety and security, now that they are finally locked in a room together. It is the strongest point of the film, held aloft by the intelligent performance of Mendelsohn rather than the youthful performance of O’Connell and problematically almost missed by MacKenzie’s direction, which is clearly driven by his desire to constantly delve into the raw aggression men long to believe obliterates all other drives. 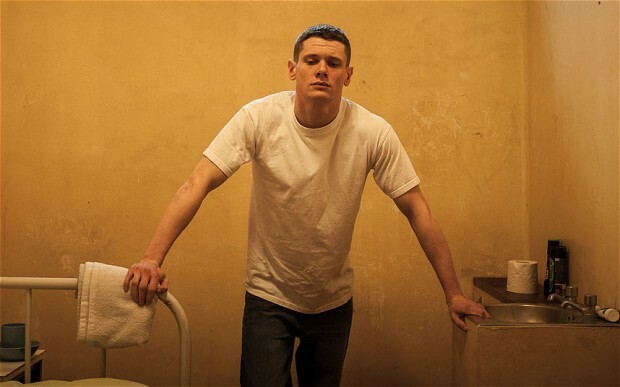 For that tension, Starred Up becomes a fascinating watch. Mendelsohn’s maturity carries the film, against the rising star power of O’Connell and the stripped back directorial style of MacKenzie, bringing all the potent depth and saving narrative interest with him. The really interesting plot point comes in the form of a rather underplayed (disappointingly watered down) performance by Rupert Friend as the prison psychologist Oliver Baumer who is given the dubious task of trying to ‘reach and redeem’ the young Eric Love (Starred Up relates to a prison jargon label for juvies who have moved on to adult prisons) under the threat of closing down the process if there is one incident to spoil it. This is the point where, had he more dedication to the original project, MacKenzies directing style would have been fascinating to watch. A large portion of the film is given over to the group therapy sessions, but they are trite, clichéd and sometimes oppressively dull, with the horribly predictable narration of Eric Love teetering on a miraculous conversion, only to be thwarted by a combination of dealing with his father in the group and corrupt prison guards. If it wasn’t for Mendelsohn the film would teeter into a horrible cartoonish silliness, and all the toothbrush razorblade slashings in the world wouln’t save it from its own mawkishness. However, one can’t help feeling that there are choices beyond Shawshank saintish redemption or Felon-esque descent into institutionalism and if anyone was going to find it, surely the prison psychologist would? Asser wrote the book for a reason after all. But Starred Up chooses both the clichéd prison options, moving for a slitherly combination of the two that is mostly masked by Mendelsohn’s great performance. This means the father son relationship becomes the most interesting aspect of the film, and the only thing (besides Mendelsohn’s performance) that separates it from just another British “oh my god is that real?” prison drama. All of this is not to say there isn’t stuff to enjoy in Starred Up, but O’Connells presence as the new “It” boy of cinema is giving it an unnatural leg up, not to mention offering critics a chance to praise him outside of the no doubt forthcoming disapproval Unbroken is bound to solicit, simply because Angelina Jolie is the director. It’s worth seeing for two great performances, and Mendelsohn fans will love seeing him shine in an otherwise fairly ordinary sky. I’m not sure how many of these sorts of films we really need. Doesn’t anyone have anything new to say about prison? Hey Chris – did you get the feeling it was a bit “samey” with so many other prison films? For me, the realism of the story and British prison slang(http://letterboxd.com/davidehrlich/film/starred-up/1/) was new, and I read somewhere that it’s more of a prison of the mind as the boy acts a similar way on the outside. Of course we’ve seen group therapy(1999’s Girl Interrupted) and father/son relationships before, with inmates and prison personnel doing bad things(In The Name of The Father), but Starred Up was different to me. Which films do you think are samey? I guess I felt it mimicked all the prison tropes (as I said in my review)as well as a lot of that British shock-realism we’ve been seeing endlessly even as far back as Trainspotting etc – but mostly I couldn’t shake the feeling that David Mackenzie was trying to be Steve McQueen a-la-Hunger. I felt Starred Up was desperately trying to be Hunger, but it didn’t have the chops that Hunger had, except for the Mendelsohn performance, which I felt carried the only truly interesting nuance. 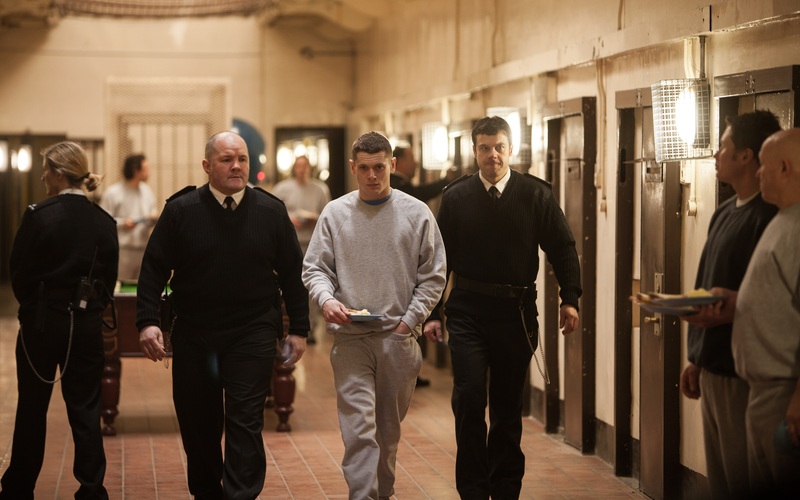 Hunger took that British style realism and told a great story through it – but Starred Up had nothing but the old cliche of the redeemed prisoner v’s bad prison guards to offer. For me it tokenised the “realism” and made it look very straight boy fantasy. And – to be honest – aren’t you sick of that tired writing trick of taking jargon and contextualising it for shock value? We’ve been seeing that through all the Godfather films,the 80’s corporate greed films, the drug films of the 90’s etc not to mention the endless boring plays that follow that idea as if it is the supermarket package assurance of brilliant writing. For me Starred Up is just another one.